It’s time to shop like crazy because it’s festival time. Amazing sales and discounts are coming your way. Yes, both Amazon and Flipkart are set to roll out exciting Dusshera and Diwali sales. It’s tyohaar time once again so get ready to shop till you drop. And why not when two of the biggest names in the online space are hosting such big sales. Here’s how to save big during the sales, via the Amazon Great Indian Festival and Flipkart Big Billion Days. 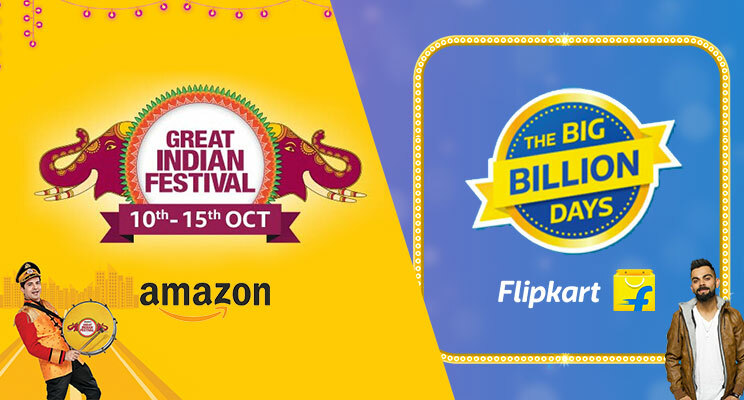 1)The exciting Amazon Great Indian Festival deals will go live from 12 AM of 10th October 2018, but you can grab the offers a day before. How? Let’s read point 2! 2)Become an Amazon Prime Member now to gain early access to the sale. Yes, although the sale is going to start from the 10th of October, it will be open to the Prime members from 9th October. 3)Grab the Golden Hour Deals prior to others only on the Amazon app. Be a night owl this time because the Golden Hour Deals will run in between 8PM to 12 AM, each and every night during the sale. 4)You will get app-only exclusive deals. So, download the app today and start creating your wishlist to make the shopping process smoother. Who knows, you may get the best deal ever! 5)If you buy Amazon Giftcard via Amazon app, you up your chances of getting up to Rs. 2300 cashback on the amount spent! 1. Use your SBI bank cards to earn 10% additional cashback on and above the sale! 2. Every hour will usher in new deals, so keep a watch. 3. The sale will be on for all the categories – mobiles, electronics, home and kitchen and Amazon fashion. One of the biggest online sales is back again, and it is none other than Flipkart’s The Big Billion Days 2018. What better way to shop for the festivities other than ordering during these Big Billion Days? This sale will run for five days starting from 10th of October 2018. Gear up so that you can shop to your heart’s content till the 14th of September, 2018. To make it easier on the customer’s pocket, Flipkart is all set to run this sale. And this time they have put up a highly apt slogan, ‘Ab India Hoga Budget Se Mukt’ supporting the idea behind The Big Billion Days 2018. You can take part in a lucky draw contest. Simply activate your PhonePe wallet! First time ever offer- Up to 90% buyback value. 10% cashback on payment via PhonePe and no cost EMI on Bajaj Finserv and credit cards. 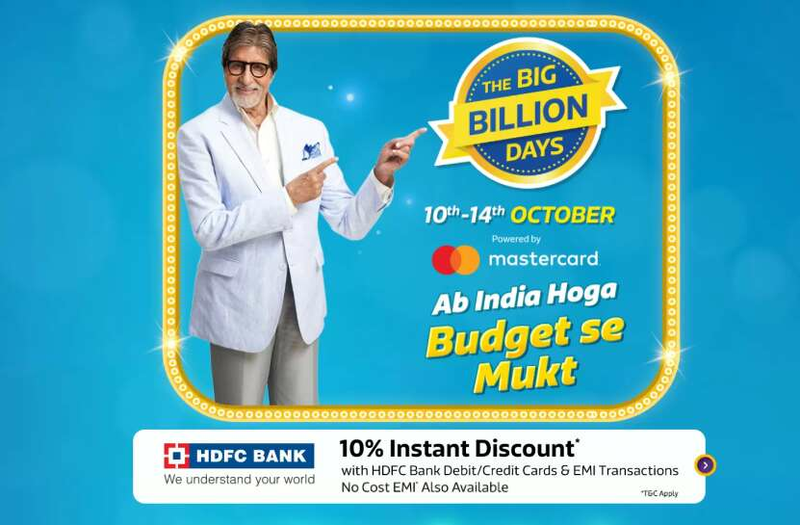 So, you have 5 big days and 5 big reasons to shop during The Big Billion Days at Flipkart. Wanna make the most of the sales at Flipkart? Follow these simple steps to make it easier for you to shop more during the sale days. 2. Save credit and debit card details to make sure that it doesn’t take much time for you to check out or else in the meantime your most wished products can get sold. 3. Keep your delivery address updated so that there is no confusion regarding the order. The answer to this is everything possible, be it the Just Launched products, the Exclusives or the Big Selection Showcase. In the fashion category, you can get amazing offers on men’s, women’s and kid’s clothing, beauty and grooming products, footwear and other essentials. In the case of electronics, you can grab huge discounts on large appliances such as refrigerators, washing machine, ACs, TVs and so on and also on all other kinds of home and kitchen appliances. High-end smartphones too will be on sale during these 5 days. So, make sure to add your favorite phone model or the latest launches to your wishlist, if you are planning to buy one now. Do not forget to check out the crazy deals on all other kinds of products such as furniture, decor, accessories and much more. Save the dates now and make the most of the sales so that you gain more than you think you can!